It is Andy Griffith like you’ve never seen him. Released in 1957, A Face in the Crowd, follows the meteoric rise of a ‘country boy’ with a saleable skill — singing. The movie opens with a local radio DJ heading to the county jail to spice up her A Face in the Crowd broadcast which interviews common, everyday people — hoping to find a rising star. Larry Rhodes (Andy Griffith), in jail for public intoxication, barters a deal with the DJ and sheriff in exchange for playing a song for the radio show. His bluesy, country sounds draws in the DJ who sees potential in the young miscreant. I’m not just an entertainer, I’m an influence, a wielder of opinion — a force. Although the film has a 1950s-era quality to the acting, it’s provocativeness comes from the dialogue — a significant portion delivered by a young Walter Matthau — and subject matter. In his drive for power, money and fame, Rhodes discards societal norms and values and lives by his own set of rules. But what the nearly 60-year-old movie does, beside addressing the hypocrisy of the rising elite, is it successfully predicts the ease of influence TV launched. Everything is a product and Rhodes is the salesman, hawking Viagra-like sugar pills and presidential candidates. Near the end of the film, Rhodes overhauls a Senator’s image with a new personality to make the Senator a more likeable presidential candidate. Despite Rhodes constant line that he is just a ‘country boy,’ he is well-schooled in market percentages and knows, not only his share of the viewing audience, but what that means in political and financial power. It’s why he advises the Senator on proper facial expressions and a better delivery style when speaking on camera. Rhodes even launches a Hee-Haw type show (Cracker Barrel) — where he just sits around and ‘chews the fat’ with his ‘country’ co-stars — so he can have a vehicle to introduce America to the new, improved (and much more marketable) Senator. Of course, as in all cautionary tales, the rise to the top is only exceeded by the fall. Rhodes becomes too brash and, when what he really thinks about his audience(they are dumb) is leaked to them, his fans abandon him. Whatever happened to .. you know what’s his name .. the one who was so big a couple years ago… the number one fella… how could we forget a name like that, by the way have you seen the new fella…. 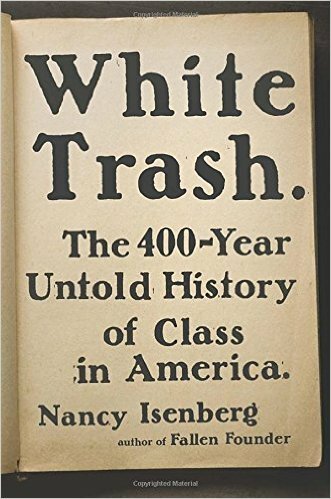 I learned about A Face in the Crowd while reading White Trash: The 400-Year Untold History of Class in America by Nancy Isenberg. As Isenberg points out in the book, the film’s director used Griffith’s childhood upbringing as a motivational technique to draw more out of the actor. The book, definitely a 5 out of 5 stars rating, addresses one of the oldest and most persistent myths in American culture: that we are a society with no class structure. Isenberg begins in the colonial era, drawing off of the writings of the Founders, and builds a case that the people used to populate the colonies were, by and large, considered ‘waste’ people. They were expendable. She follows the theme of class up to the present time, showing, among other things, how political leaders exploit the class structure — often by pitting one class against another. Despite being a more ‘scholarly’ book (with ample footnotes), White Trash is a very interesting, easy read. I highly recommend the book for anyone seeking a more in-depth understanding of America’s culture and history.